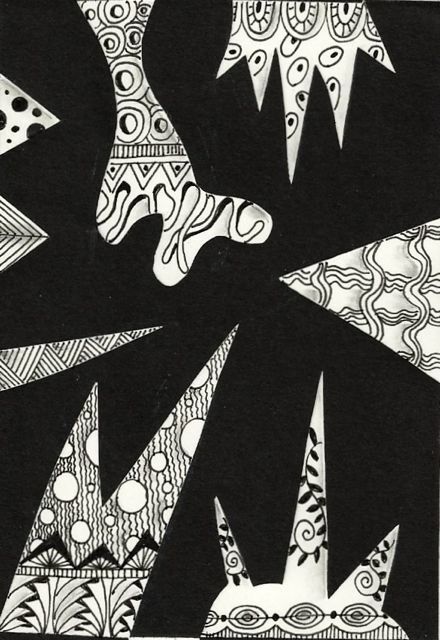 View a YouTube, exploring optical illusion and Zentangle inspired art. 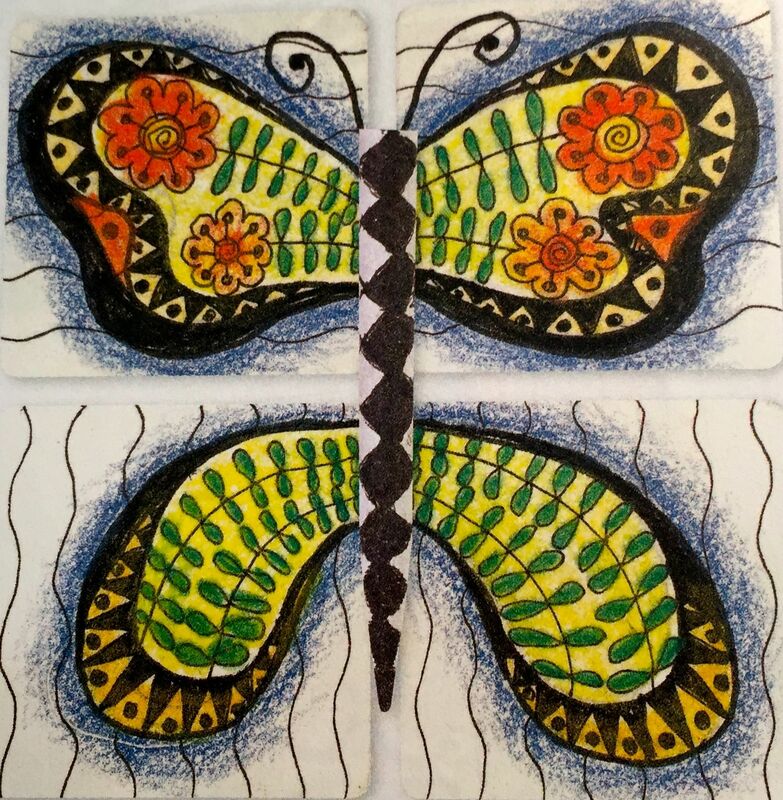 As you know one of my passions in life is working with my hands… it can be sketching, painting, Zentangle®, glass, clay, designing art books, well almost anything creative will do. 2015 and 2016 have been filled with creative opportunities that I’d like to share with you. 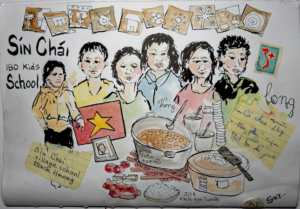 Last November I had the opportunity to visit Vietnam and Cambodia. 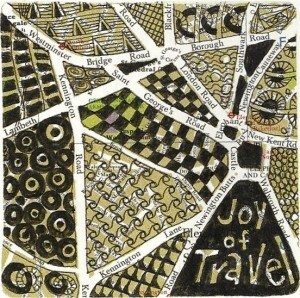 I traveled with other adventurous spirits on a trip by OAT (OverseasAdventureTravel). 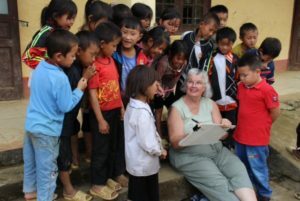 The trip lasted 4 weeks and we explored from SAPA in Northern Vietnam where the hill tribes live, all the way down to the Mekong Delta in the South, and then over to Angkor Wat in Cambodia. Every day was an adventure… just waiting to be preserved in my sketchbook and photos. In SAPA we visited a school where we stopped at a market to purchase vegetables (trying to communicate in Vietnamese, they did not speak English in the market). 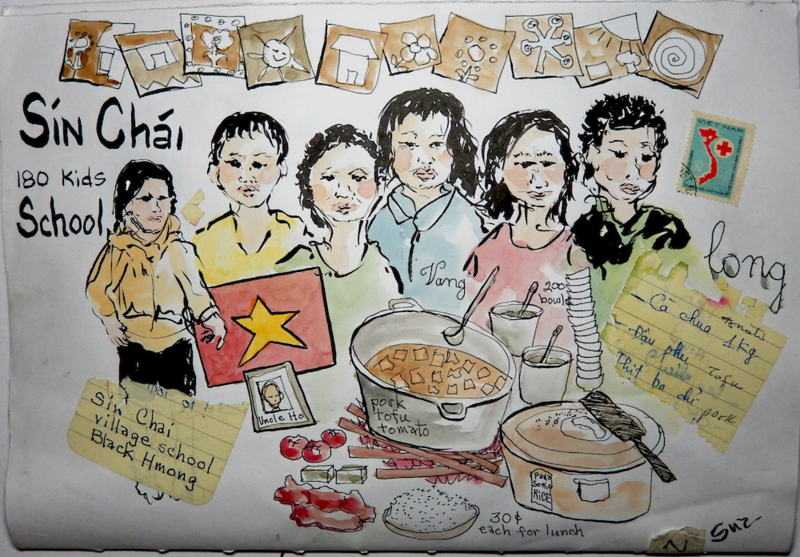 I sketched the school children during recess and enjoyed meeting them. The children were fascinated and some wanted to join me by drawing in my sketchbook. 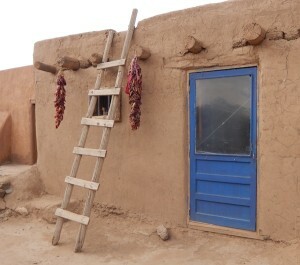 Being able to interact with local people added to personal memories of the trip. 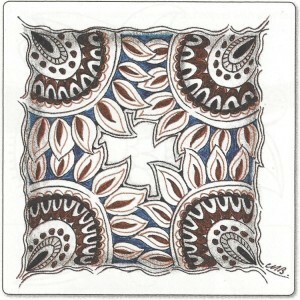 After returning home I covered my sketchbook with hand-stitched textiles from the Hmong and Dao tribal peoples. I also did some painting with images inspired by my sketchbook. 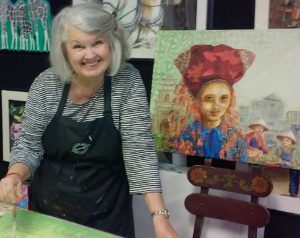 See the painting of my friend SuMe… she is from the Red Dao tribe. A big NEW BOOK Iover 100 pages) is in the works and I am really excited. 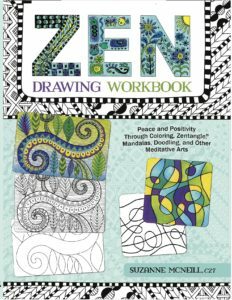 I packed every page full of innovative ideas, instructions and prompts for sketching, coloring, Tangles, grids, FloraBunda and more. 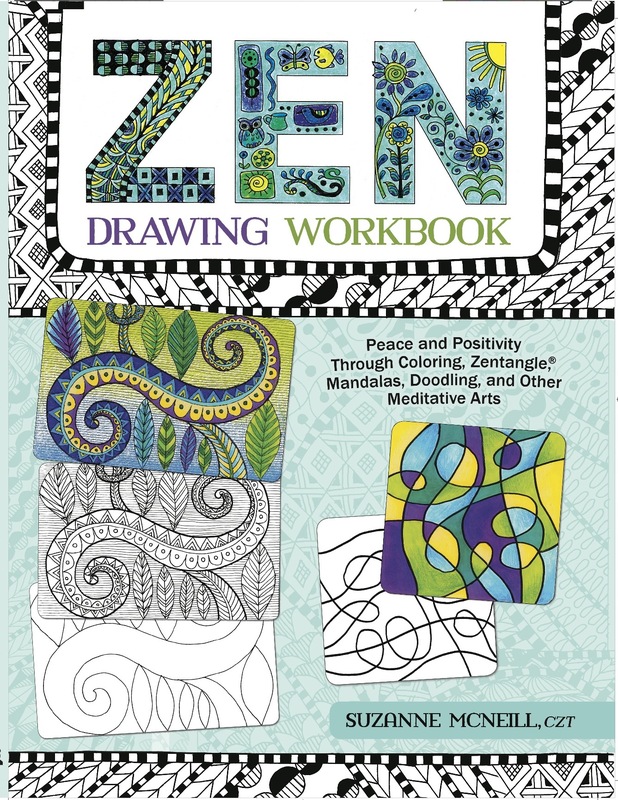 I just finished proofing the pages and it is still at the printers… but can be pre-ordered from Amazon (search for ‘ZEN DRAWING WORKBOOK’ under books). 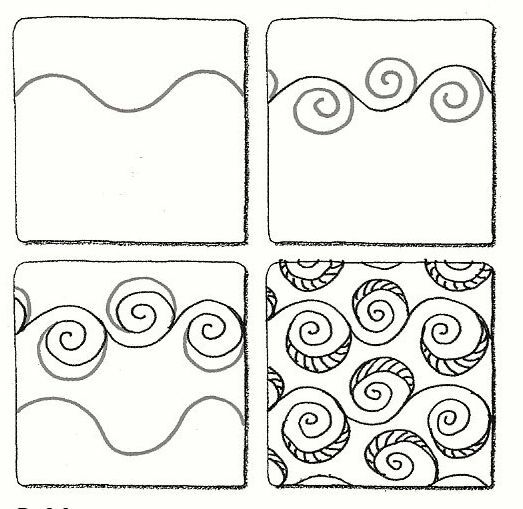 View YouTube, a simple ink blowing process to add variety to your Zentangle art. 2015 has been a wonderful time to visit with family. Cindy Shepard’s family is so large that she hosted two family Christmas banquets in her home. Now that the holidays are over, it is time to think toward 2016. 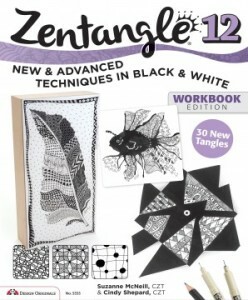 In January, Cindy and I will attend CHA (Craft & Hobby Association) convention in Anaheim, CA to demonstrate ‘Zentangle® – Notan-style’ from her new book, Zentangle 12, in the Fox Chapel Publishing booth #1545. If you are attending stop by from 12:00-2:00 on Saturday Jan 9 or from 10:00-12:00 on Sunday Jan 10 to let Cindy show you how. In California Cindy is excited to see all the new products. 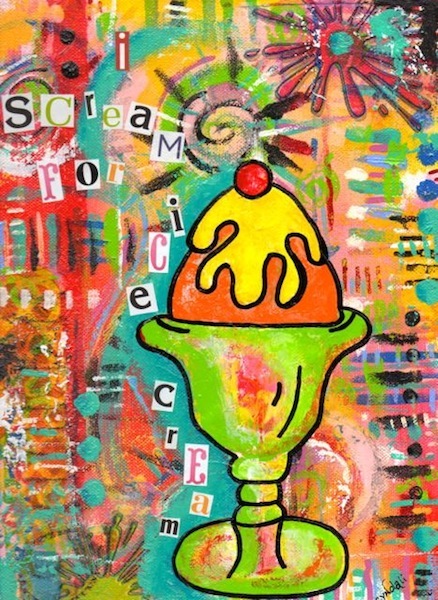 She loves cheerful colors and loves to create fun whimsical designs. 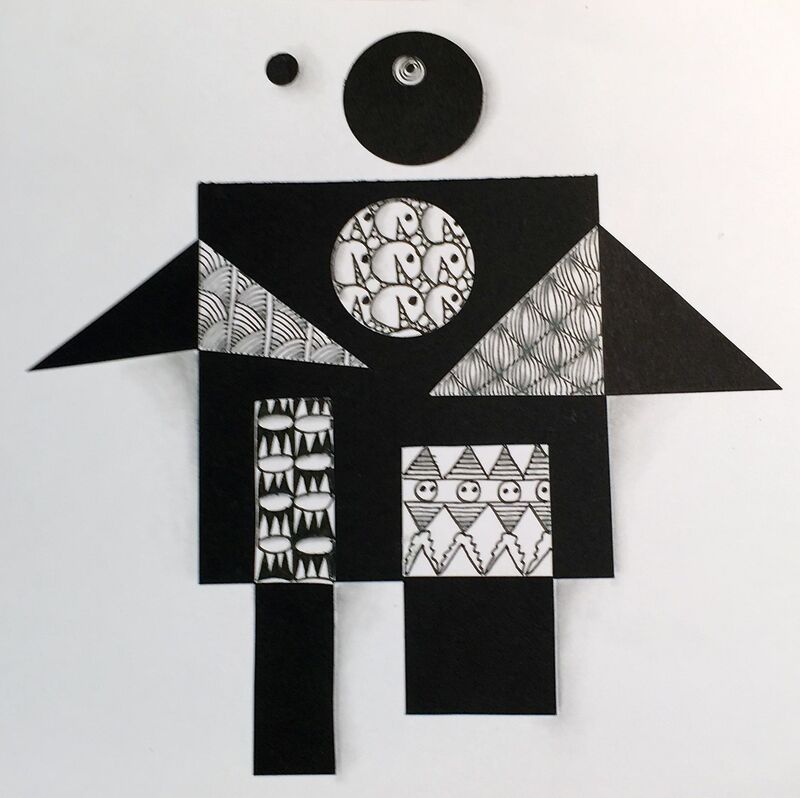 She also looks forward to taking a collage class with Julie Fei Fan Balzer at Crescendoh studio. 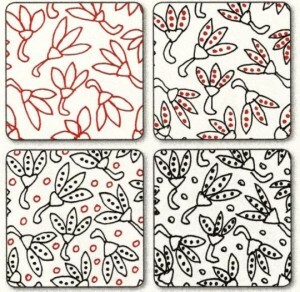 Whimsical designs are Cindy’s favorite. She says that they cheer up her life and make her days happier. Visit Cindy’s website, she also teaches at Sparks Creative Arts Studio. 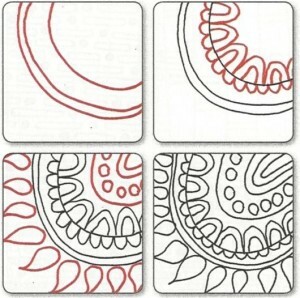 View a YouTube, have some fun with stencils and tangles. Cindy Shepard CZT shows you how to make gift tags and more. My friend, Cindy Shepard, had a wonderful time teaching at Bella Crafts Connections in Minnesota. Cindy had fabulous students in her classes. 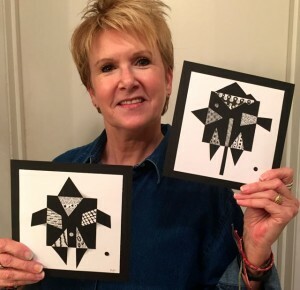 Inspired by designs from the book ‘Zentangle 12’, Barb and Annie had fun putting together Quirky birds, Tangles, stencils, and colors. 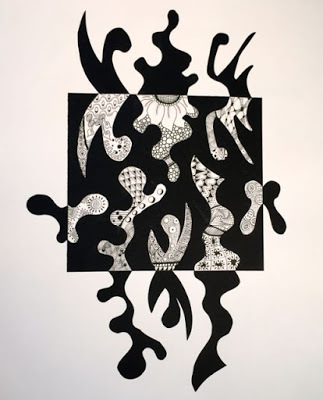 One of Cindy’s favorite inspirations for Zentangle is the process of Notan (a Japanese inspired art that balances black and white – read all about it in ‘Zentangle 12’). Pictured here is an advanced design but even ‘newbies’ can create amazing Notan art. Birds and more birds… Cindy loves quirky images of birds. 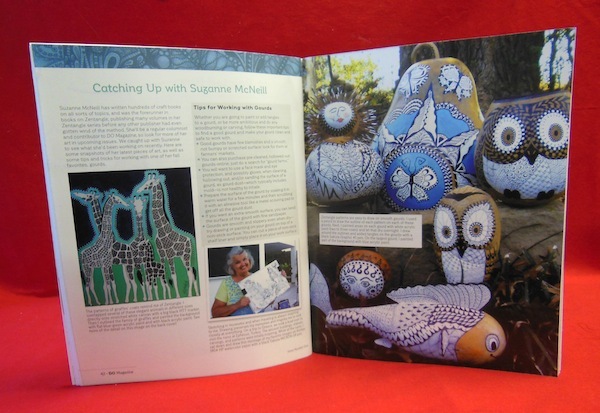 She incorporates Zentangle® patterns with whimsical bird figures. Nothing beats a Micron pen for tangling and the brilliant color for the birds was achieved with Inktense pencils and Koi Water Brushes. For extra punch Cindy added a ‘Shattered’ stencil design from StencilGirl. 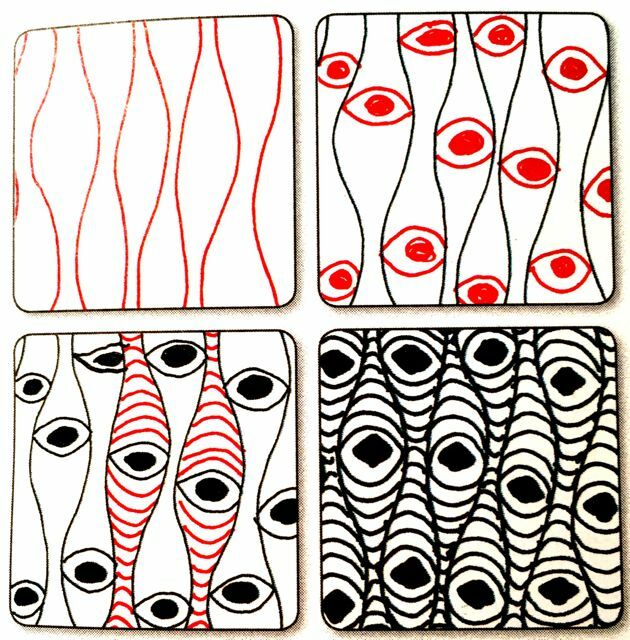 View a YouTube, create a unique and beautiful bracelet using FloraBunda designs. Ready for holiday gifts? I want to show you a few projects from my popular class on FloraBunda at SparksStudioArt.com. Here’s a quick, fun, affordable and perfect way to make personalized gifts and cards for everyone on your list. The results are beautiful. You can even personalize mugs with a name or your favorite saying. 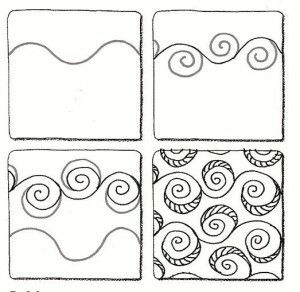 Ann loves drawing easy FloraBunda designs. 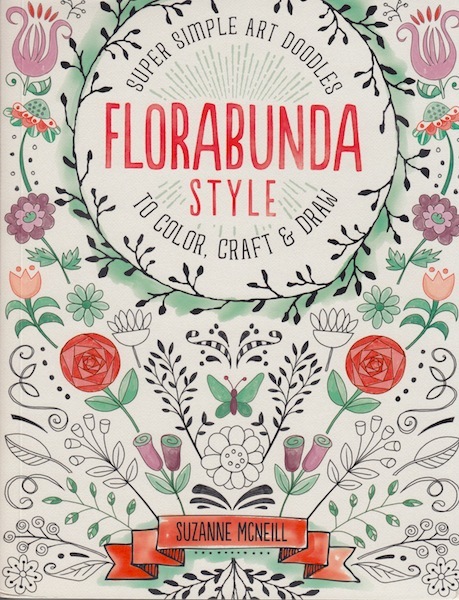 FloraBunda refers to hundreds of floral and leaf designs (available in FloraBunda books)… all are fantasy type flowers so anyone can draw amazing designs with dozens of variations. So how do you get started?… The supplies are simple. 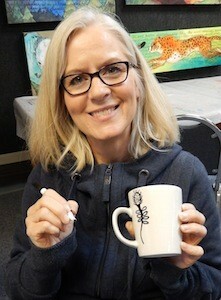 All you need is a ceramic mug and a black DecoArt ceramic/glass marker. Bake it in your home oven to make the mug dishwasher safe. 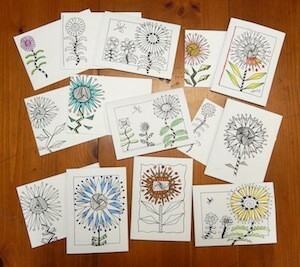 Personalize cards with flowers and watercolors. 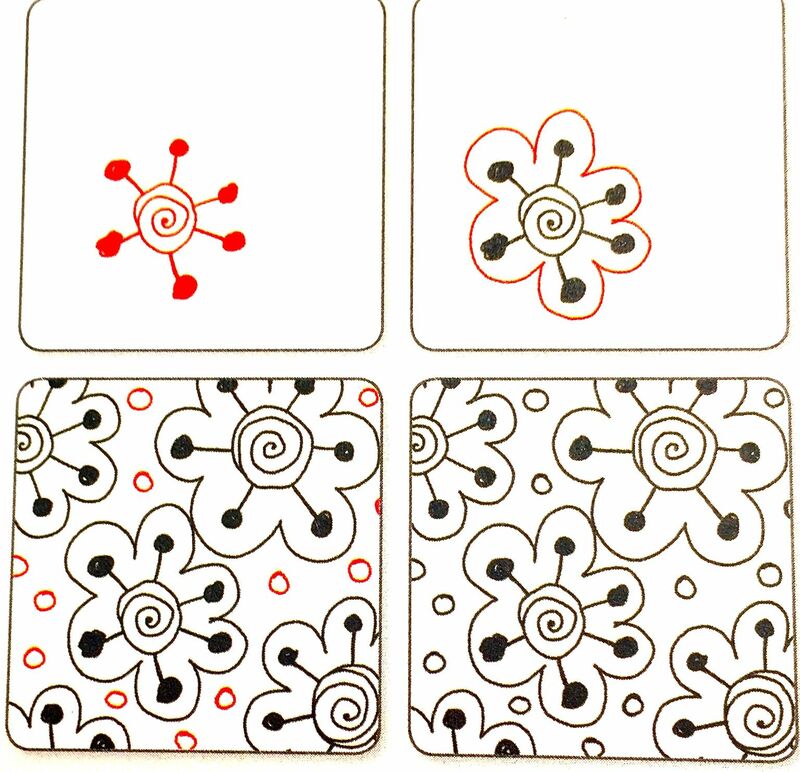 FloraBunda note cards are simple – draw with a black MICRON #08 or Graphic #1 pen. Add color with markers, color pencils or watercolors and a brush. TIP: Don’t have time to draw dozens of cards,take your black drawings to a shop and have them copied. 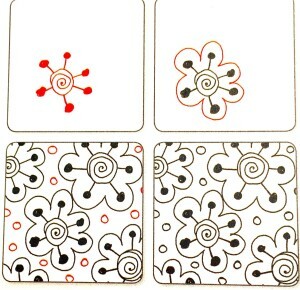 Then add a touch of color to each card by hand. 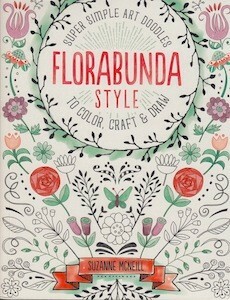 The latest release in the FloraBunda book series! 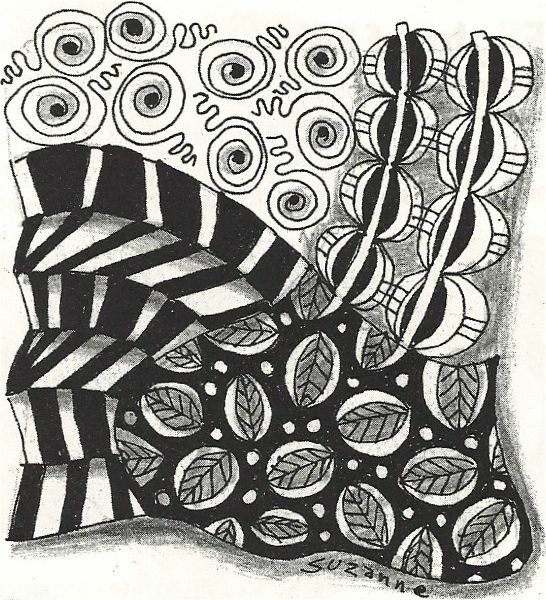 View a YouTube, Zentangle Notan – Black and White, Cindy Shepard CZT shows you how to incorporate the art of Notan with tangle patterns. 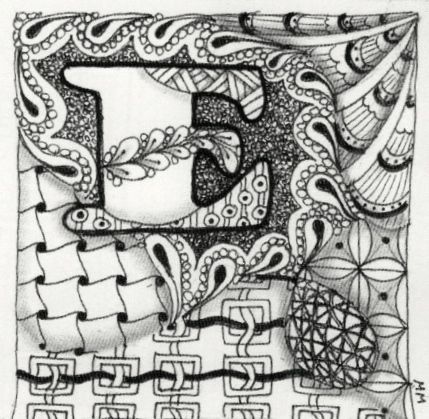 Bring your Zentangle Art to life! 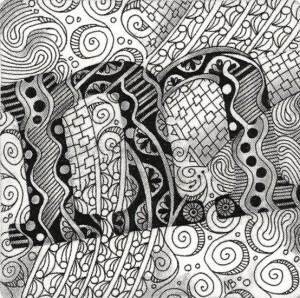 My talented mixed media friend Cindy Shepard CZT mixes ‘Notan’ with Zentangle patterns for a great new look… ‘Zen-Notan’ designs in black&white. 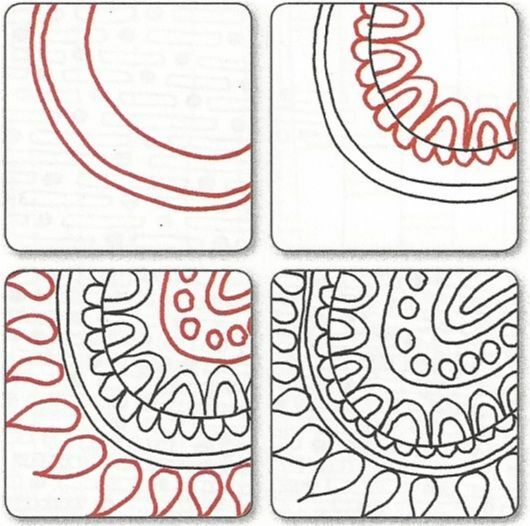 I am hooked – it is a perfect and beautiful pairing for Zentangle. 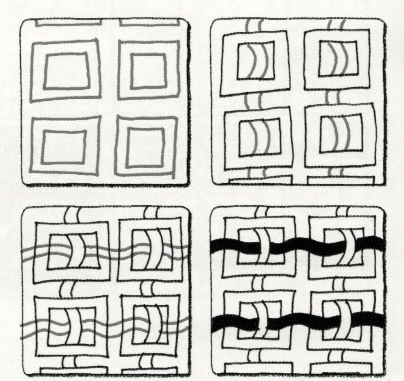 Notan is the Japanese word for dark/light, it celebrates the beauty of black and white and the interaction between the two. 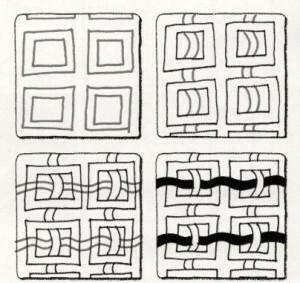 The Yin and Yang symbol is an example of this mirror image… one black and one white. So how do you get started?... All you need is paper, scissors and a glue stick. The simplicity of Notan paper cutting combined with Micron black pens is addictive (a calm, positive, and good addiction, I might add). View a YouTube, – create a beautiful silhouette framed paper doll using brush markers, colored pencils and FloraBunda patterns. 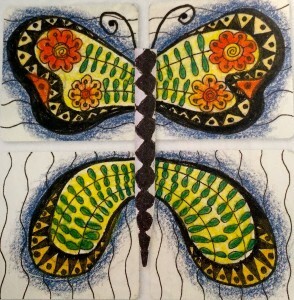 I love art… Painting, drawing, coloring, Zentangle®, doodling... all of these are my relaxing pastimes. New books feature ‘FloraBunda’ style art doodling and contain hundreds of smallish, simple floral, forest and garden images. Right in tune with the craze for coloring. ‘FloraBunda’ is perfect for teens and adults. 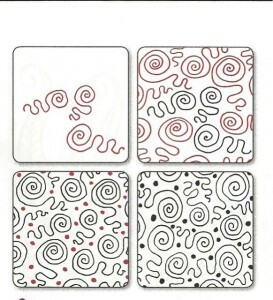 Just anyone who enjoys art – or anyone who wants to learn a simple way to be an artist will enjoy art doodling. 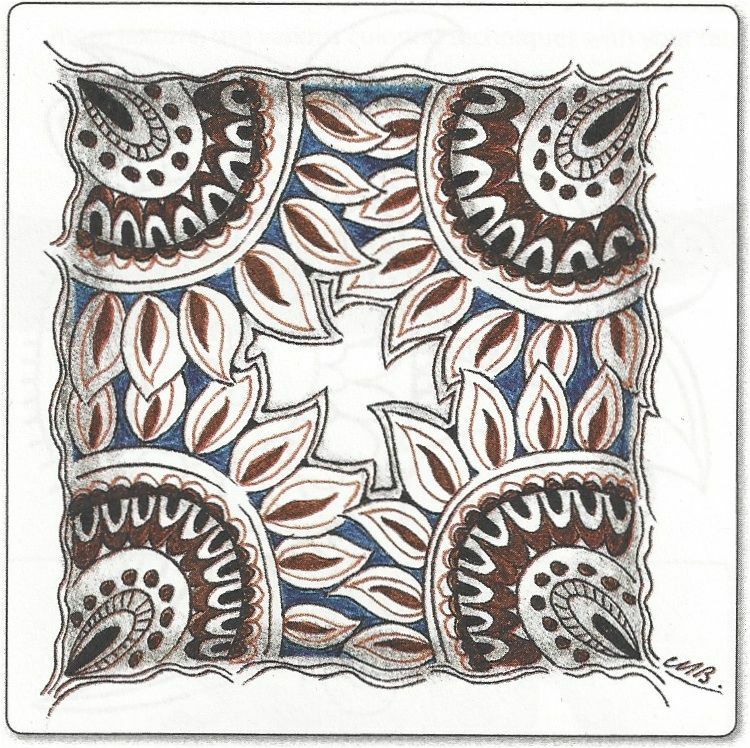 With only a few basic supplies, it is enjoyable to draw and color art doodles. 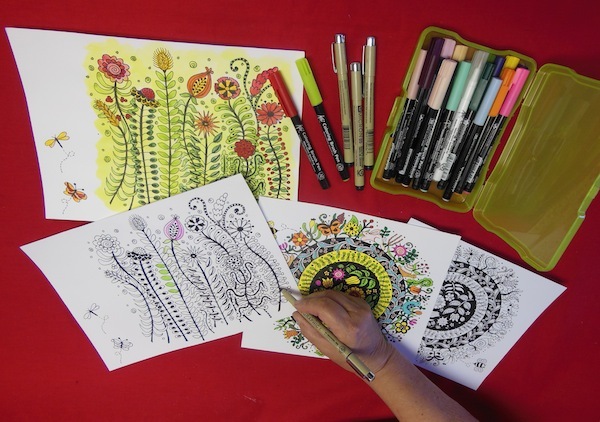 Draw your own coloring pages, gift cards, notebook covers and decorate almost anything with a breath of fresh air and art. ‘FloraBunda’ Style – a big book of over 100 pages is a must-have inspiration book for every art library. 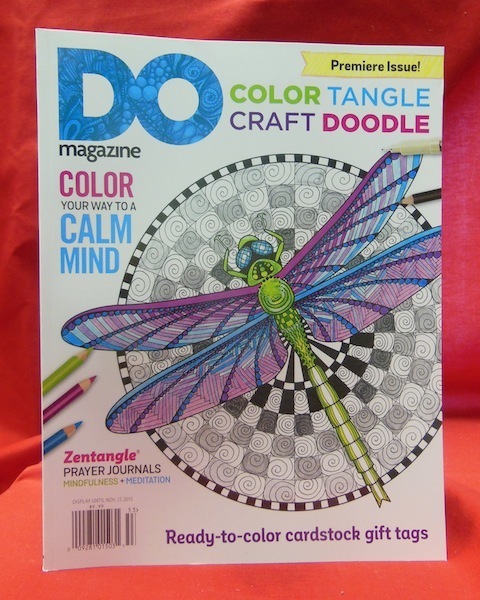 The pages are packed with art doodles and coloring pages… how to art doodle, how to color, what to use, projects to decorate, and more. Enjoy every page! 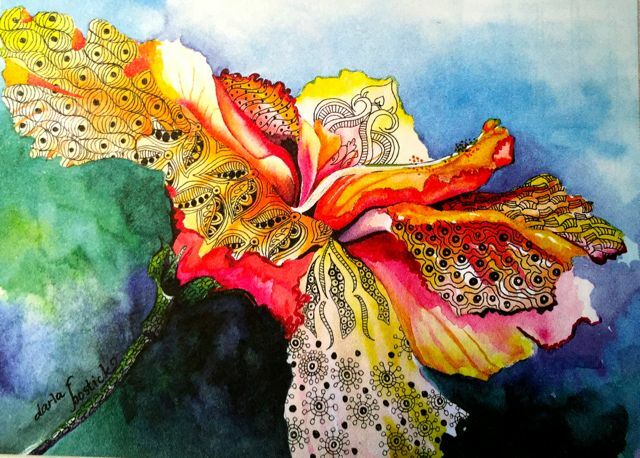 View a YouTube, how to draw beautiful FloraBunda patterns, plus tips for adding lucious color with Koi markers and Prismacolor pencils. 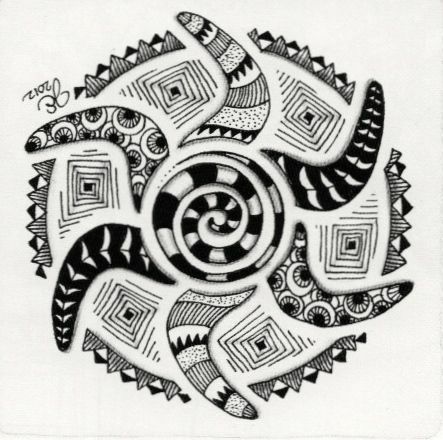 Inspiring art and original designs! A copy of the premiere issue of ‘DO’ MAGAZINE arrived on my doorstep. I love this innovative magazine! What?… another magazine? Oh but wait, this magazine is special. Almost 100 pages chock-full of inspiration. 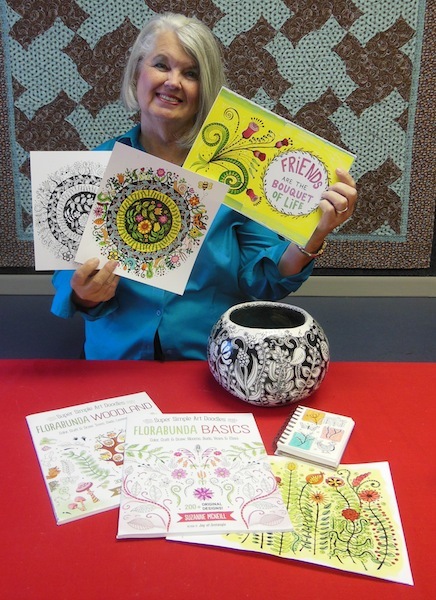 It contains coloring pages of fabulous inspiring designs, special tips for arts and crafts, and articles on some of my favorite art friends… Marie Browning and Joanne Fink. There are also features on artists that I admire… Ben Kwok, Valentina Harper, Kati Erney, Thaneeya McArdle and Jess Volinski. And a surprise article on pages 42-43 about me and my art. There is also information about FloraBunda garden art. Add this issue to your stash of “valuable and inspiring”. 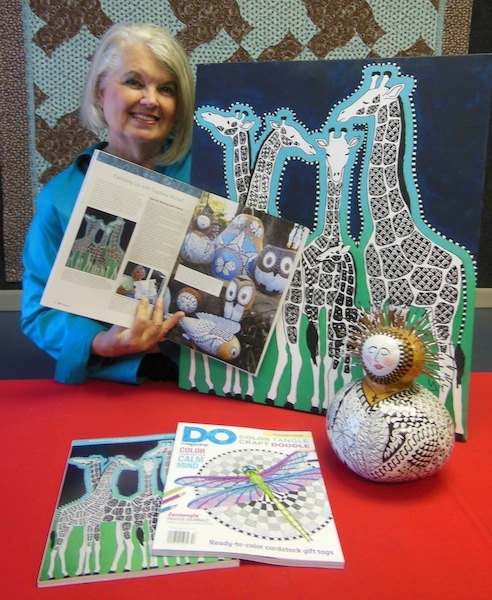 It is available with magazines at your local store – or by subscription from Fox Chapel Publishing Co. Have fun! View a YouTube, creative ways to incorporate treasured maps with Zentangle® art. 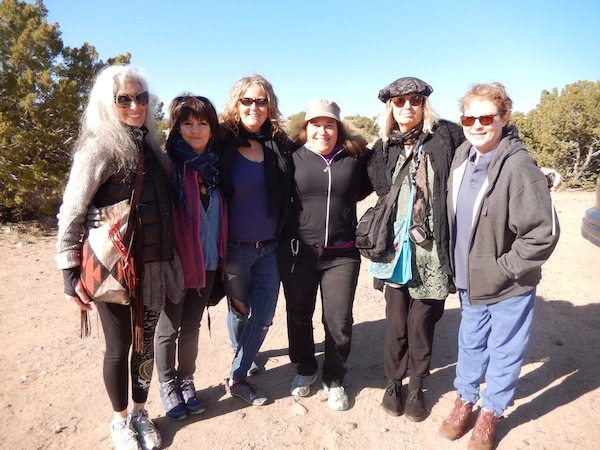 Santa Fe, NM is an inspiring place to visit… wonderful artists, cutting edge art, and inspiration in every direction. 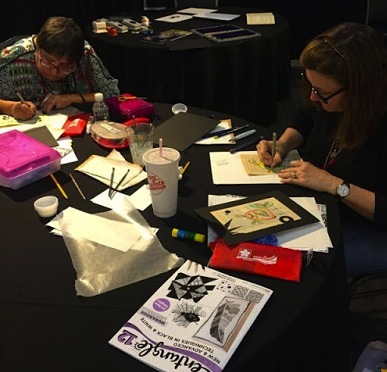 This Spring I had the opportunity to teach Zentangle® at Tangle U, hold a sketch journaling class at Guadalupe Stamp store, and take a week long ceramics workshop from. 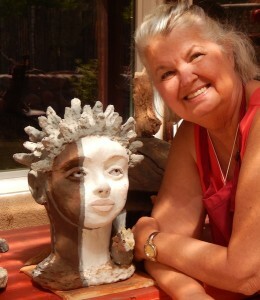 Amazing ceramics by Debra Frittz (debrafritts.net) caught my eye when I was in Abiqui, NM last year. 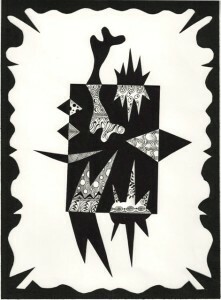 I LOVE her women, animal spirit, and totem sculptures. 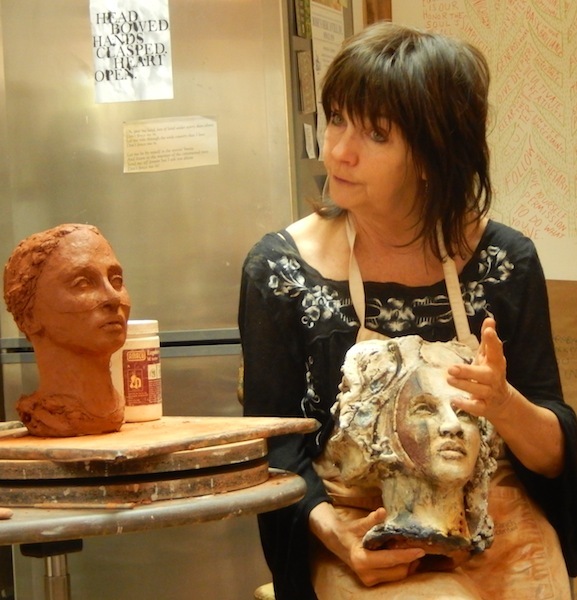 Debra shared her secrets for sculpting and glazing clay. 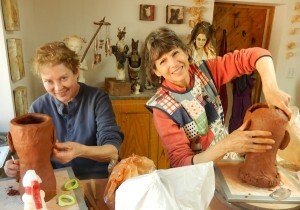 Students sculpting faces, totems and creatures. I love the enthusiastic students who attend Debra’s class. Each project was unique. 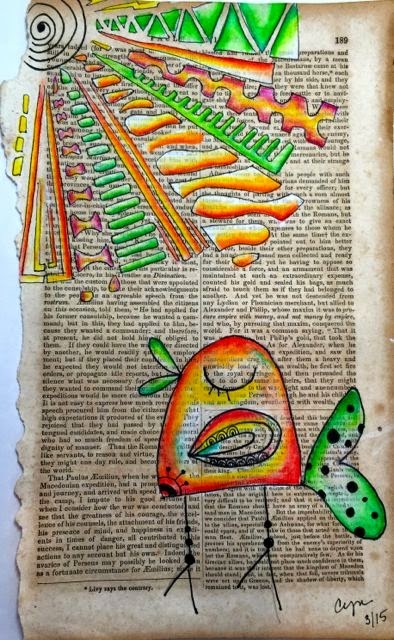 It is always fun to see how student artists add their own touch to art. Woman with spikey hair and an owl totem. My favorite projects were a large face, a woman with a bunny, a sculpture with my three sisters, and small personal totems. Enthusiastic students taking a morning hike. The smiles on the faces of students started every day on a happy note. Up early to go on a short hike in the New Mexico wilderness… perfect inspiration for a day of art. A perfect heart rock – about 200 pounds. 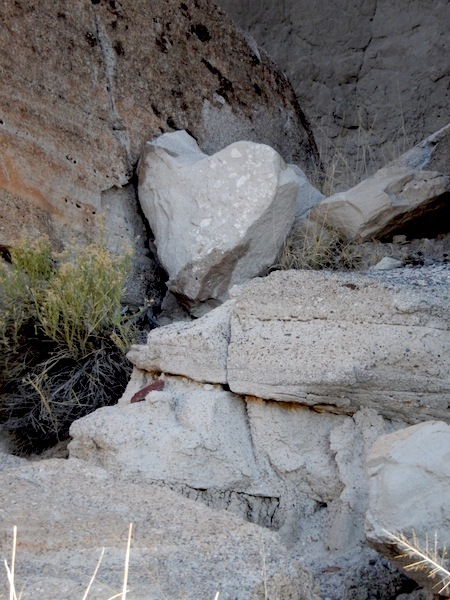 On our hike we found a giant heart rock. It was balanced in a canyon to be admired by hikers. View a YouTube, how to combine Gelli Arts® printing and tangle patterns. 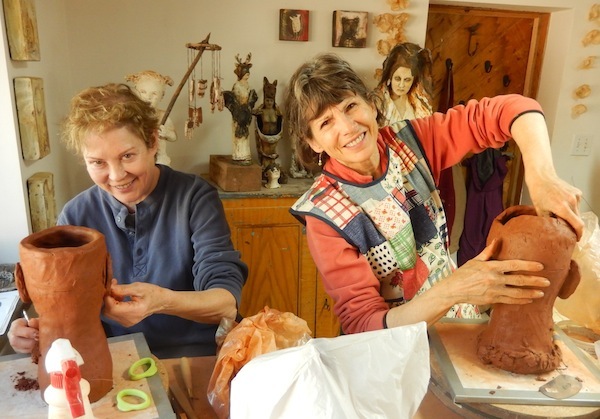 No trip to Santa Fe would be complete without shopping at the Artisan store… their selection of art supplies is totally inspiring. Zentangle books… authored by me! 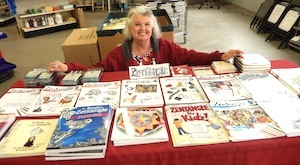 When I walked in the Artisan store, they had a display of my books laid out on a table. Even I was impressed with the selection. Since I work on designing one book at a time, I rarely see the collection laid out together. 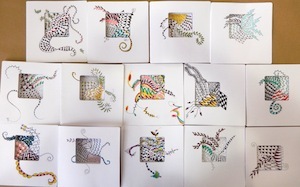 It seems unbelievable that I have authored over 12 books on the theme of Zentangle. 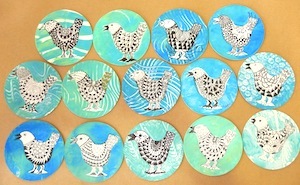 Tangled birds with Gelli printing. I love the enthusiastic students who attend my classes. 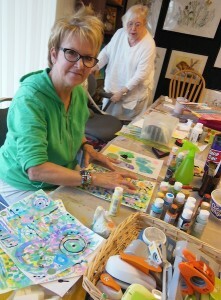 This year we had fun using Gelli Arts printing plates to add color and texture to paper tiles. 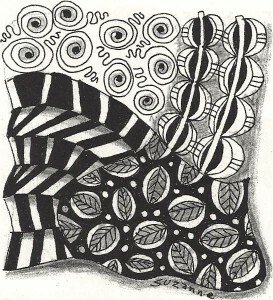 Then we added Tangle patterns in the white bird. 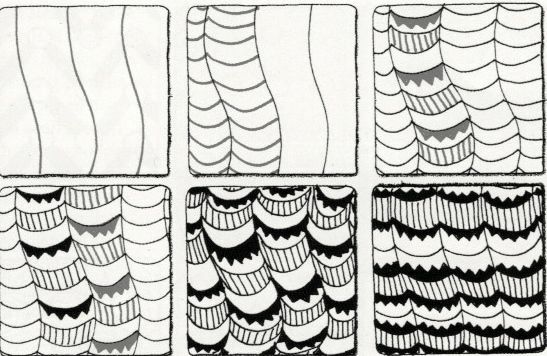 It is always fun to see how student artists draw the patterns… each bird is unique. 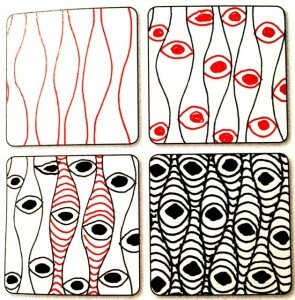 Little window cards with Peek-a-Boos. 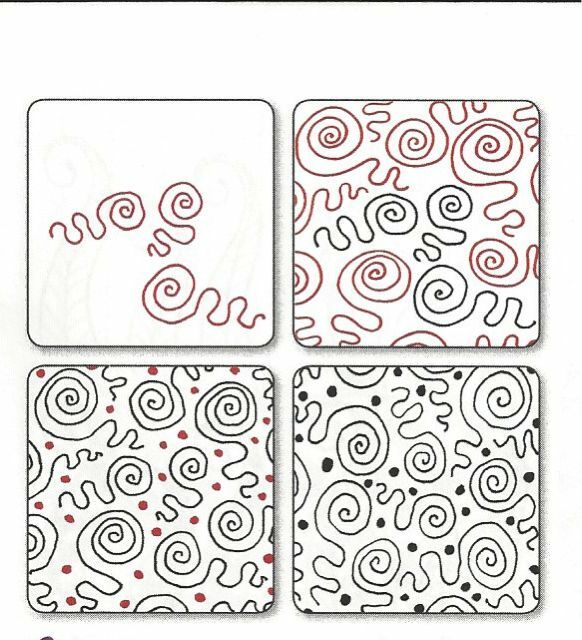 Ever since I developed the Peek-a-Boo Tangle cards, they have been one of my favorite projects to teach. 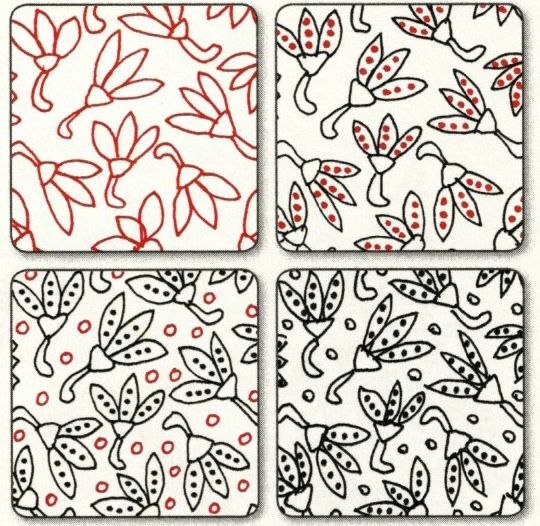 Every one of the designs is a fun and colorful surprise. The smiles on the faces of students make teaching classes worthwhile. The Zentangle® art form and method was created by Rick Roberts and Maria Thomas and is copyrighted. Zentangle® is a registered trademark of Zentangle, Inc. and is used with permission. Learn more at zentangle.com. 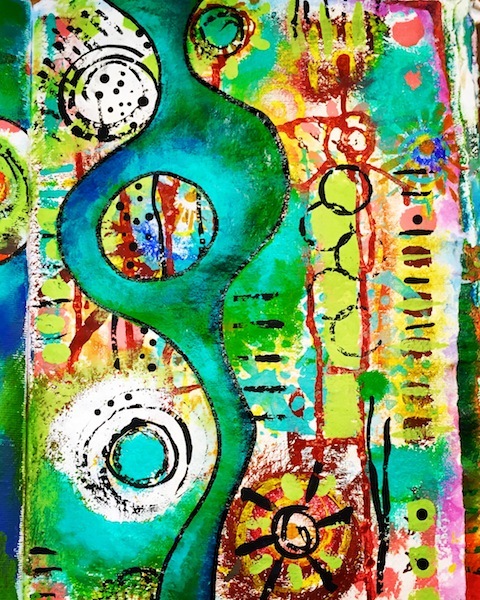 Gelli Art® is a registered trademark of Gelli Arts® LLC and is used with permission. Learn more at gelliarts.com. 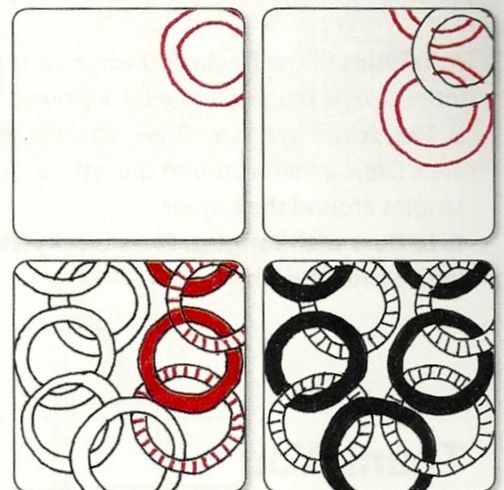 View a YouTube, inspirations for adding tangle patterns to words, quotes and sentiments in a variety of fun ways. I am blessed in so many ways. 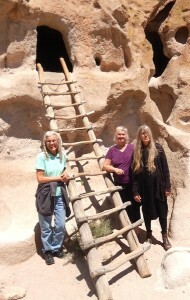 My sister Amy lives in Santa Fe, New Mexico. I visit her every year. 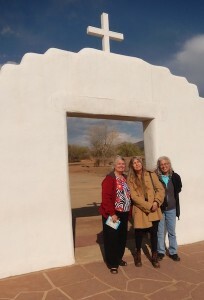 I love the white cross and arch. We climbed up the ladder to see how it was to live in the cave 1200 years ago. We both love the Native American culture, adobe architecture, historic value, and wonderful artwork in this area of the United States. This year my other sister Brendy joined us. 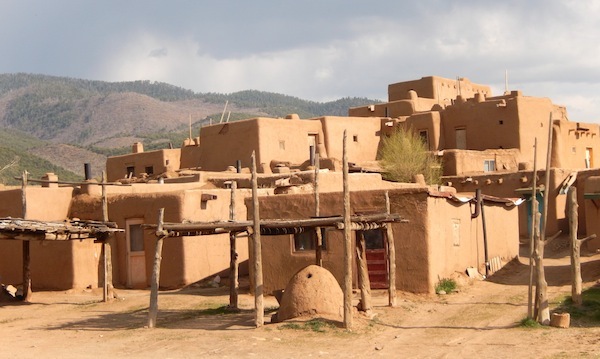 We visited the oldest continuously inhabited town in the United States. We felt like the three musketeers as we toured Taos Pueblo, Bandolier Monument and Ruins, and just generally had fun catching up, visiting and enjoying each other’s company. Blue sky, blue doors, ladders… everything in Taos is beautiful.